PVC Shrink Wrap Film ~ Bags, Rolls, and Tubing! Save On Orders of 5 or More Rolls! Request a quote online or call! Centerfold PVC shrink wrap rolls in clear and tinted colors. PVC stands for polyvinyl chloride, one of the most commonly produced plastics in the world. PVC plastic has been around since the early 19th century. Today, one of the most well known uses for PVC plastic is in pipe. PVC pipe is often used for water and sewer transportation applications. PVC plastic is also found in a variety of other objects around us. PVC plastic is in everything from clothes, signs, flooring, and packaging. PVC shrink wrap is one of the most commonly used materials in the packaging industry. PVC shrink wrap is ideal for a variety of packaging situations. Known to be an excellent shrink film for high speed machines and manually operated machines. PVC shrink film is commonly found in centerfold rolls 500 ft., 1500 ft., 2000 ft. lengths and a wide variety of widths. We currently offer a 75 ga. and a 100 ga. PVC shrink film in multiple widths. *PVC Shrink Film has been a common polymer used for years in the packaging industry as well as many other industries. PVC shrink film is ideal for high speed operations and is often the preferred shrink wrap for many operations. PVC shrink film has been used for years to wrap everything from CD's to paint trays. Here is a detailed article about PVC shrink film and common uses. Clear PVC shrink wrap is by far the most common, but colored shrink wrap is used in a variety of industries to help products stand out on shelves. *Cost Advantage- PVC shrink rolls are more affordable than polyolefin shrink wrap. Depending on the width of PVC shrink wrap you choose, they can vary from 2.9 cents per foot to 8 cents per foot. Those figures are from our 2000 ft. PVC shrink rolls. We also offer a smaller 500 ft. centerfold rolls for smaller output operations. There are multiple options to choose from when deciding a packaging material for your products. PVC shrink wrap is a great option to consider. The ability to maintain an affordable price, while allowing excellent presentation of your product makes PVC shrink wrap a great choice. *Protection- PVC shrink film, like any shrink wrap has the ability to offer protection from tampering and exterior elements. Both centerfold PVC shrink and Polyolefin shrink are great for providing that extra tamper security. Along with assisting in tamper evidence, shrink film is great for protection from exterior elements like dust, pollen, and moisture. A centerfold shrink film will not make your products completely water proof, but it does provide extra protection from moisture. *Shrinking & Sealing- PVC shrink film has great shrinking and sealing properties. Our PVC shrink rolls have up to a 40% shrink rate. Along with a high shrink rate, the film requires a low temperature to shrink. We always recommend a larger width of film than your product. In the "How to measure" section you will see that we recommend buying a shrink film a couple of inches bigger than your product measurements. This wider film allows extra film for sealing, as well as room for the film to shrink when applying heat. Too large of shrink film can cause "dog ears" in the corners of the product. That is why we recommend using the formula below for measuring. *Precautions- We always recommend proper ventilation when sealing and shrinking PVC shrink wrap. The Chloride in the film emits a strong odor that can be harmful if too much is inhaled. PVC shrink wrap can not come into direct contact with consumable products. It can be used for secondary packaging, but not for direct food contact. We recommend the use of a centerfold polyolefin shrink wrap for direct contact with food. Centerfold PVC shrink film offers a strong seal and superior clarity at an affordable price. We do offer other thicknesses, feel free to call our sales department for more information on any of our shrink wrap products at 1-800-441-5090. Common Centerfold PVC Sizes - For high speed machines, 2000 ft. centerfold rolls are commonly used. For manual shrink machines many customers choose to use 500 ft. rolls. 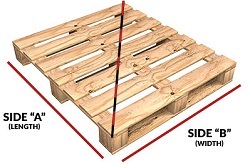 See commonly used widths below. PVC Centerfold Shrink Wrap- The easiest way to measure for centerfold shrink wrap is to add the width and depth, then add 2-3 inches. If a product is 10 inches wide and 4 inches tall, you would add 10+4+2=16. A 16 inch wide film would be ideal for wrapping the product. If a 16 inch film is not available, go up to the next size of film, never go down in size.